Both D2 tool steel and S30V are top quality metals that are normally found in the more high-end blades out on the market. However, they both have their perks and are better in different ways and for different situations so you really need to know what you are going to be using it for before you make your decision. The main difference between the two metals is that D2 steel is what you would call tool steel which means that it is not a resistant to the elements and, as a result, is more susceptible to rust and corrosion. Whereas S30V steel is what is considered to be stainless steel meaning that it will be more restitant if not 100% rust and corrosion resistant. However, if you take good care of your D2 you will find that it will stay corrosion free and work just as well the S30V in this regard, although if you don’t want to spend a lot of time cleaning the blade then you would be better to go for s30v steel. Now both of these steels will make for an incredibly sharp blade, no doubting that. However, there is a slight difference as to which one is going to be sharper than the other. Many have found (including me) that the S30v will be able to get that slightly finer and sharper edge then the D2 tool steel, however not by much. However, on the other hand, most people find that the d2 is easier to sharpen the S30v so if you are a beginner or not that an experienced of a sharpener then it should be something that you consider. 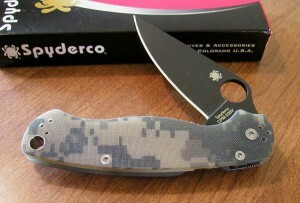 Edge retention is really where the D2 steel shines. Once you sharpen a D2 steel blade you will find that this bad boy will keep its fine edge for a long long time, far longer then your S30v typically would. This means you are going to have a super sharp edge for the majority of the time and your not going to have to sharpen it as often as you would with S30v steel. Furthermore, the D2 steel isn’t as brittle and more likely to chip or break as the S30v would as it is a tougher quality steel. Furthermore, if you are looking for a larger blade, then I would recommend the D2 as in most cases the larger the blade is, the less suitable S30v steel comes for it. Overall, both the D2 tool steel and the S30v are top quality metals that are going to serve you very well. 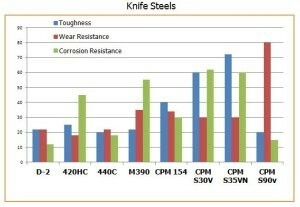 Both metals are going to give you a strong and reliable blade with good edge retention and a high level of sharpness. However, my favorite would have to be the D2 steel just because I find it to be slightly tougher and more reliable then the S30v but I own knives with both metals and half the time I can barely tell the difference! How to Sharpen a Pocket Knife? What is the Best Deer Boning Knife?